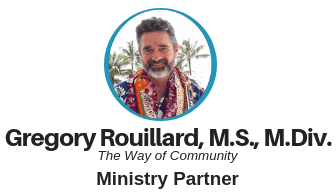 Gregory Rouillard, M.S., M.Div. grew up in a small town in western Colorado and graduated from the U.S. Naval Academy in Annapolis, Maryland. He served in the U.S. Marine Corps for twenty years as an AV-8B Harrier pilot and in numerous other roles. He earned a Master of Science in Operations Research at the U.S. Naval Postgraduate School in 2003 and retired from the Marines in 2008. Near the end of his career as a Marine, Gregory met John Buck and began to study and practice the Sociocratic Circle-Organization Method. At about the same time he began to study and practice Compassionate Communication with Capital NVC, an organization in the Washington, D.C. area which became his first Sociocratic consulting client. After moving back home to Colorado in 2009, Gregory developed the Way of Community philosophy and framework and continued to refine his understanding and embodied application of its methods. He has walked the community journey with numerous groups around the U.S., including NVC organizations in Denver and Madison, Wisconsin, the Boulder Valley School District, cohousing communities in Colorado, Utah, Virginia and Oklahoma, and faith communities in Virginia, Colorado, Utah, California, Washington, Arizona and Texas. Since 2014 he has been working closely with the Kalikalos Holistic Learning Community in the Pilio region of central Greece. Gregory currently lives in Boulder, Colorado. He holds a Master of Divinity degree from Naropa University and is a Certified Trainer with the Center for Nonviolent Communication. Visit Gregory's website, The Way of Community, HERE.